Review: The Nova Grapplers are not a lackluster clan. The difficulty involved with them is their lack of cards rather than the utility or power behind any particular unit. 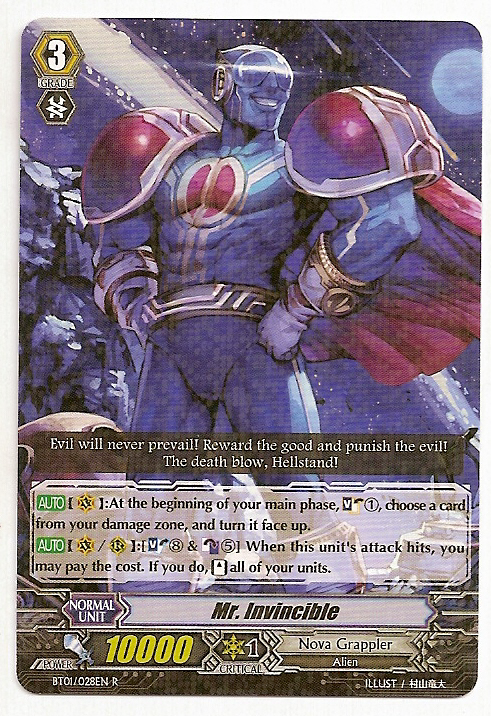 For a Grappler cardfighter, the main problem is being overwhelmed by extremely good cards that nonetheless have no place in their particular build. This is evident right from their debut set, where Asura Kaiser introduces himself as an unrelenting stand engine. Although his primary skill is only active in the vanguard circle, the army backing Kaiser's title is his 11000 power. Because in vanguard, only units of greater than or equal to power than their target can successfully retire or damage a given unit on attack, this 11000 power makes the Kaiser virtually invincible in straightforward battle. If the opponent calls a boosting unit to help retire a rearguard Kaiser, then the opponent has just used two units to eliminate 1--wearing their hand down. Furthermore, 11000-power units have an inherent advantage in every circle concerning how easy it is to shield them from attacks. If a 20000-power column attacks the Kaiser, it takes a single critical trigger or especial intercept from NGM Prototype to block their attack, versus the critical and draw that 10000-power vanguards require. 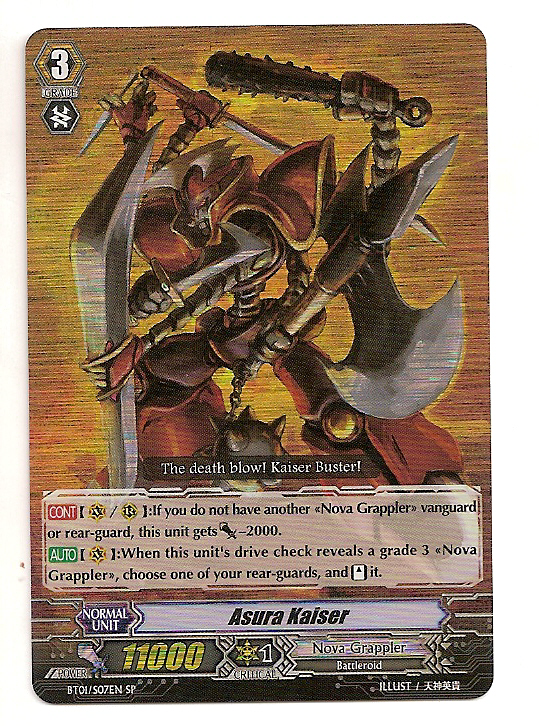 This protects the hand and firmly cements Kaiser as the throne of the Nova Grapplers. Following on his heels is Mr. Invincible, this clan's other old standby. Although Amaterasu precedes him in the setlist, many consider Invincible the originator of the megablast strategy because of his unique skill setup. Invincible is not just the crown of the Grappler throne, but a prized unit in many mixed builds both for his ability to unflip damage via soulcharge and his counterblast 5 soulblast 8 megablast skill. This skill, standing all rearguards, makes Invincible dangerous to combat even when unboosted, as his skill will still activate as long as his attack connects, regardless of whether that attack was on the vanguard or rearguard. While the Nova Grapplers lack the same amount of dedicated soulcharging as Oracle Think Tank and the Royal Paladins, Invincible's skill is not the most difficult to pull off and oftentimes the threat of it precedes its use in importance. Unlike with some other clans, both of these cards have an immediate use in the vanguard and rearguard. Their skills combo well--using Kaiser's skill to stand an Invincible that has already attacked is only going to give the opponent their worst day--and their disadvantages are tuned just so that a pure Nova fighter won't even need to consider them. It's more of a challenge to find a Nova deck that these two can't bring a strong image to.